games for kids -- who is making these up?! Back from Oakland -- it was a good, though short, trip. Spent the night at Margaret's place (upgraded to a 1BR since the last time I was there) and her most adorable cat Tiger. To play this game you need a large group of kids. First you line each child up and then you set a timer for eighty seconds. In front of each child place a paper plate with a teaspoon of sugar, a pencil and a clothespin. Say go to start the race. Each child will have to lick up their pile of sugar. Next they stick the pencil up their nose (but not too far - you'll need to demonstrate to keep it safe) And last they take the clothespin and put it on their sock or pants. Whoever finishes first gets a prize. All the kids get to keep their pencils. Have fun!! It's probably better to stick with classics, like Simon Says. I'm upset at myself for having spent five hours driving today and not gotten anywhere. My plan was to go to Oakland to spend the night with a friend before checking out a possible summer internship all day tomorrow. My journey was cut short when I found myself in the middle of California with no money and no gas. Ok, that last statement is an exaggeration. But what happened was that I managed to drive approximately 130 miles north, just past Bakersfield, decide that my car needed gas, only to realize that I'd left home without my wallet. That is, I'd left home without my driver's license, credit cards, and cash. Lucky for me, I had $7.49 cents in my coin bucket -- the dollars stowed for emergency parking on the USC campus, plus some miscellaneous change. Some quick calculations based on the small amount of gas remaining in the tank, plus the approximately 2 gallons I could purchase at the price of $3.719/gallon, and I thought I just might have enough to get back home, or at least close enough that I could convince someone from LA to come get me if I ended up stranded nearby. Other options that I considered were trying to get to some cash transfer place (was it Western Union that used to have those commercials?) in Bakersfield, but I couldn't get anyone on the phone at 4:30 in the afternoon, and I had no idea how I'd find such a place. I thought about trying to sell my iPod or the Garmin GPS I had in the car at a discounted price to other gas station customers. I thought about what kind of loss I might have to take. I thought about making money via my services: I could offer to work at the gas station, after all, they did have a Help Wanted sign in the window. Or maybe I could wash dishes at the IHOP next door. I could offer drivers 5 minute massages for $5. I thought about how I might approach strangers to ask them to lend me money. Then I thought about how strangers who approach us for money usually don't seem credible. In the end I decided to fill up the tank with as much gas as I could afford, turn around and head home. Going a pretty consistent 55mph with the windows rolled up and no AC, I just had enough gas to get home (my gas indicator on). I haven't solved the mystery of what happened to my alarm on Saturday morning -- whether I turned it off without realizing or never set it correctly in the first place. I used a travel alarm clock that I rarely use because my phone provides a sufficient alarm. For some reason I decided that leaving my phone off and using the travel alarm instead would save me some battery. Ultimately, it's probably bad to have this additional positive reinforcement after showing up at the airport so late. This only increases the likelihood that I will be slow in getting to the airport next time when I figure I can make it. (Though the intentionality of it is questionable, we have certainly done it before). The extra hour of sleep was probably worth it, since we'd gone to bed only about 5 hours earlier. Saturday was a long session-filled day at ICA 2007, the conference I was attending, and I barely made it through the party USC was hosting from 7-9pm. the sense of possibility and urgency that Alex instilled when he dropped me off curbside and explained, "If you're going to make it, you've got to be pushy and make it to the front of the line. Tell people that your flight is boarding and you need to go." The woman checking boarding passes and ID before the security lines told me to cut to the front. my willingness and ability to run -- though dressed for the conference, I wore running shoes (I typically do). The fact that I've been running more lately and improving my speed and capacity undoubtedly helped. I heard an announcement for my flight's final boarding call as I sprinted (as much as possible while wheeling a suitcase behind) through Terminal 5. I don't recommend making a regular habit of cutting in line, but some of the other aspects certainly helped. I intend to keep my running practiced. Arex previously blogged some tips on how to get through security checkpoints quickly. Her flight was scheduled to board at 6:45 AM on Saturday, and with laundry and packing, we hadn't gotten to bed until (well) past two in the morning the previous evening. She had set two alarms for herself, and I had one for myself. Never the less, we got up at 6:33 AM. I specifically remember snoozing my alarm. I remember doing this many times. I also remember finally turning it off. Elaine doesn't know why her alarms didn't wake her up. Were they never turned on? Did she simply sleep through them? At 6:33 AM, I woke up (seemingly on my own), glanced at my clock, and then really woke up. With very little delay we hurried out the door and zipped double-quick to the airport. Twenty minutes after we woke up, Elaine was stepping out of the car at LAX. Having checking in the previous night, Elaine managed to catch her flight. Her take: "It's hard to run through an airport when you've recently given blood." The key aspect of the phenomenological experience of this mild insomnia is that I feel far too many thoughts running through my head, one after another, each one interrupting the one before and leading me down a new path. This symptom causes me to believe that my inability to fall asleep is due to overactivity in my brain. I don't remember how long ago it would have been, but before I discovered my power of instasleep, I'd sometimes have trouble falling asleep. And I used to have the exact same feeling. My trick back then was to visualize numbers as I counted down from 99. I will try that. If that fails, I'll imagine a relaxing, tranquil scene. Like a waterfall or a beach. Or what life will be like a week from today. Maybe I should test a new set of earplugs. We still have enough. Not that long after my decision to actively be more positive, I started going to a Joke of the Day site regularly. I'd visit on Wednesday mornings, at the beginning of my marathon day on campus. I'd get to class early and have a few minutes to spare before everyone else arrived. I think it helped, particularly during the middle of the term when everything started to get hectic and crazy. Even though things have calmed down substantially, I still like to check the website and rate a few jokes sometimes. A man and an ostrich walk into a restaurant. The waitress asks, "What will it be?" The man replied "a burger and a coke." "And you?" "I'll have the same," the ostrich replies. They finish their meal and pay. "That will be $4.50," The man reached into his pocket and pulled out the exact amount. They do this every day till Fri.
"The usual?" she asked. "No, today is Friday. I'll have steak and a coke." "Me too." says the ostrich. They finish and pay. "That will be $10.95"
The man reached in and pulls out the exact amount again just like all week. The waitress was dumb-founded. "How is it that you always have the exact amount?" "Well," says the man. "I was cleaning my attic and I found a dusty lamp. I rubbed it and a genie appeared." Wow!" said the waitress. "What did you wish for?" "I asked that when I needed to pay for something, the exact amount would appear in my pocket." "Amazing! Most people would ask for a million dollars. But what's with the ostrich?" "Well," said the man. "I also asked for a chick with long legs." I think I found this joke funny because I like jokes that present ridiculous scenarios / imagery and play on words. It would amuse me to come up with tags for the different types of humor in these jokes. I wonder how much of relational compatibility you can predict simply based on whether two people think the same types of jokes are funny. I had frozen pizzas in the trunk of my car and failed to notice that they'd been left behind after the rest of the groceries were taken in. 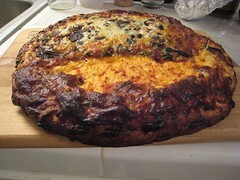 Here's what happens when you leave frozen pizzas standing vertically overnight -- everything on the pizza tries to move to the bottom of the box! I took a year+ of Classical Greek in college. It is unimpressive compared to 4 years of high school Latin, 1 semester of working with my college professor to translate Renaissance Latin (correspondence of Antonio Riccoboni, who seems obscure enough to not have a Wikipedia page in English), and 1 semester translating Lucrecius (Latin upper division course, which I tanked). But also impressive because ... well, it's Classical Greek. There is something both impressive and foolish about having studied two dead languages and the long-gone cultures from which they came. I've lost most of my liberal arts education in Classics. As my dad would say, I have returned it to where I originally got it from. But I still love Aristotle, one of the greatest thinkers ever. My iGoogle page reminded me of this because #4 (below) appeared in my quotes of the day widget. Number 8 is the one I have been thinking about most lately. 1) A flatterer is a friend who is your inferior, or pretends to be so. 2) A friend is a second self. 3) All human actions have one or more of these seven causes: chance, nature, compulsion, habit, reason, passion, and desire. 4) All paid jobs absorb and degrade the mind. 5) All virtue is summed up in dealing justly. 6) Dignity consists not in possessing honors, but in the consciousness that we deserve them. 7) Education is the best provision for the journey to old age. 8) Happiness depends upon ourselves. 9) Humor is the only test of gravity, and gravity of humor; for a subject which will not bear raillery is suspicious, and a jest which will not bear serious examination is false wit. 10) In the arena of human life the honors and rewards fall to those who show their good qualities. 11) It is in justice that the ordering of society is centered. 12) It is the mark of an educated mind to be able to entertain a thought without accepting it. 13) It is unbecoming for young men to utter maxims. 14) Law is mind without reason. 15) Man perfected by society is the best of all animals; he is the most terrible of all when he lives without law, and without justice. 16) Men acquire a particular quality by constantly acting a particular way...you become just by performing just actions, temperate by performing temperate actions, brave by performing brave actions. 17) Pleasure in the job puts perfection in the work. 18) Poverty is the parent of revolution and crime. 19) The Gods too are fond of a joke. 20) The only stable state is the one in which all men are equal before the law. 21) To give a satisfactory decision as to the truth it is necessary to be rather an arbitrator than a party to the dispute. 22) To perceive is to suffer. 23) We are what we repeatedly do. 24) Young people are in a condition like permanent intoxication, because youth is sweet and they are growing. 25) It is not always the same thing to be a good man and a good citizen. 26) Misfortune shows those who are not really friends. 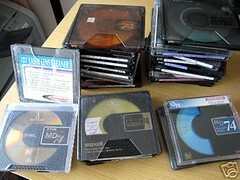 The item was a lot of 28 used minidiscs, and it's been so long since I've listened to them that I don't remember what's on there. But I believe the artist he is talking about is Richie Yam, also known as Richie Ren or Richie Jen (a Cantonese vs. Taiwan vs. China spelling difference). The buyer expressed appreciation for the fast shipping -- I always figure it's appreciated, but usually I only hear it in a line of eBay feedback. He told me about music I might like, which is a great social gift. I AM a big fan of David Tao. Now I know the only Caucasian guy in the midwest who likes Chinese pop music. Tonight we had dinner at Joe's Crab Shack in Newport Beach to celebrate Mother's Day with the Irvine-side family. It was very crowded and took us a while to get a seat. During the wait we had time to browse the many crab-themed products they had available, peruse the menu, watch the restaurant staff do a 10 minute dance, play 3 or 4 games of hangman, and start a game of 20 questions. Overall impressions: the ambiance was loud and cluttered, the menu was not vegetarian-friendly, and the dinner food was indistinguishably mediocre. In sum, it was not worth the wait. But going to Irvine for Parents' Day (Father's Day got added in somehow, too) was nice. Dean, Alex, and I helped mom plant impatients in the backyard garden. Even though I'm supposedly moved out and married, it still feels like home. We are more frugal in some of these categories than in others. It's rare that we eat out, but we sprung for a Nintendo Wii at above-market price. 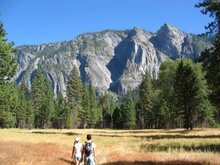 The general philosophy that we live by very compatibly includes that a) we have money in order to use it, and b) money should not be needlessly used, so when reasonable, save. Today I will share my thoughts on sector 1 : eating out and going out. Eating out (decrease). Granted, if you happen to live in an area abundant in Chinese food (countries with a Chinese cultural history, or Arcadia or the San Gabriel Valley), eating out can be very, very cheap. But it is SO, so easy to go to the Cheesecake Factory with friends and drop $20 for dinner after tax and tip. And you might not even be getting any cheesecake. Friend's birthday dinner? Now you can include part of their meal (you can't let someone pay on their own birthday). Also please include miscellaneous drinks, appetizers, and desserts that other people have gotten but you are now paying for because someone suggested an equal split for the tab. $25. 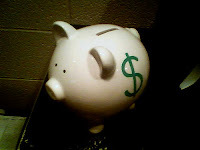 This is not to say that we never eat out, but the less often you do, the more you will save. It is often appropriate to eat out if it is the most convenient way to dine with friends, or when celebrating a special occasion. But since one of us is vegetarian, it's usually easier to eat in than to eat out. Not eating out will be more difficult to accomplish for the foodie or if you are employed as a professional food blogger. Compared to my first year in grad school, I've also improved a whole lot as far as packing my own lunch to bring. Via lifehacker, save $988 a year by packing your own lunch. I've also cut back substantially on the money I pay Starbucks for coffee by brewing my own. Savings: $300-$800 per year, depending on your coffee drink of choice. Finally, the added bonus of making your own food instead of eating out is that it is bound to be healthier 9 times out of 10. I totally just made that statistic up. Going out, like, to play (decrease or cheapen). Much to the disappointment of my former roommate, we don't go out very often, and when we do, we tend not to spend much money being out. I suppose this means we are either Very Boring or Easily Satisfied. I prefer to think of this characteristic as "low-maintenance." It doesn't mean that all we do is stay in and watch TV. We don't actually have a TV (we watch shows via the Internet), so that would be hard. But we do go out for walks in the neighborhood (cheap and good for your health), going grocery shopping (cheap and functional), sailing at the UCLA MAC (free because Alex is a volunteer TA for their classes), reading together or apart at the bookstore, seeing a movie (usually for free with movie passes either of us have gotten from donating blood). Staying in (increase). Staying in is usually cheaper than going out, unless the main activity is buying things online, or something like that. If you are willing to put in some effort of preparing food and cleaning up, inviting people over to your home for dinner should turn out to be cheaper eats. Especially if people take turns hosting in. We also like to have people over for board or video games (we have spent money buying these), which are more socially interactive than going out to see a movie. Is eating out cheaper than eating in? ...California food-flavoring workers recently diagnosed with bronchiolitis obliterans, a rare and life-threatening form of fixed obstructive lung disease. Also known as popcorn workers lung, because it has turned up in workers at microwave-popcorn factories, the disease destroys the lungs. A transplant is the only cure. Granted, the amount of artificial butter flavor (diacetyl) they work with is probably more than the average person is ever going to encounter. But I believe it's good to minimize ingestion of bizarre chemicals whenever you can. 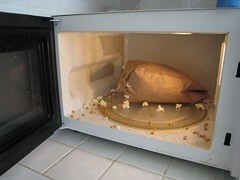 Put about 1/4 cup of popcorn in a small paper lunch bag. Fold the top and staple closed. Microwave! Voila! AB suggests olive oil, kosher salt, and seasoning, but I've found that the olive oil gets the bag greasy and isn't necessary. You can fiddle a bit with the amount of popcorn and microwave time, but as evidenced by the photograph, 1/2 a cup seems to be too much. If you want more flavor, something I have found effective is to spray a bit of olive oil on the popcorn after it's been popped, sprinkle in some kosher salt, and shake up the bag. Less messy all around. Try the brown bag popcorn. It's better for you, and the texture compared to the other stuff (movie popcorn included) can't be beat. I will try to cross off items as they actually occur. I've been thinking about getting a heart rate monitor for a while now. My last one, a Mio Shape Select Petite bit the dust a little over a year ago, within about a month-and-a-half of my purchasing it on Amazon. Disappointingly, replacing the battery and taking the watch apart only fixed it for a day. My calls to customer support were not returned, and the Mio community emails I occasionally receive are like a poke in the eye (I really should remove myself from their list). The neat thing about the Mio watches are that they do not require a chest strap for use. You apply your index and middle fingers to sensors on the face of the watch. But I decided that a chest strap wouldn't be too much of a hassle and would monitor my heart rate continuously. 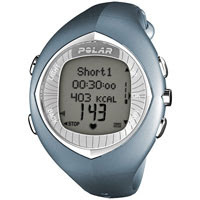 After some online research I decided to order a Polar Women's F11 from Amazon. I also considered the Nike Imara, but for reasons I've now forgotten, I decided to go with Polar. The chest strap is a comfortable fit. It tracks exercise and fitness progress in various manners, so that you can look over what you've done over the last week. You can upload your data to Polar's online training program with just your watch and a microphone. It's compatible with all of the cardio machines I've tried so far at the gym, so that their output indicates my HR without having to hold onto sensors on the handlebars. It gave me a trophy last night for completing my workout goals for the week! If you set it up for OwnZone it wants you to stay within specific heart rate zones, or your exercise timer won't count down. This seems reasonable if I'm going under, but going over should count, no? But you can turn that feature off. Also, it's pretty bulky for regular wear. Oh well. Anyway, the proof is in the pudding. Hopefully I will continue to improve in cardiovascular fitness and enjoy the process. I did 5.6 treadmill miles yesterday and felt like I could have kept going. Getting a parking un-ticket in L.A. Since living in Los Angeles (I'm going on 8 years now), I have definitely gotten my share of parking violations. Between morning street cleaning in Westwood, Palms, USC, and Mar Vista; expired meters at UCLA and USC; one ticket for parking against a red curb (I parked late at night and didn't see); and one ticket for parking on Vermont in Koreatown into rush hour (I didn't think lunch would last that long), I would be a whole lot wealthier were it not for my careless non-driving. So after leaving campus on Monday last week, as I approached my car from up the street, I was definitely not shocked when I noticed that a small, white envelope had been tucked under my windshield wiper. Usually I know when I may be unlucky because I've been kept late and my parking meter has probably expired, so I started to become confused and angry at L.A. and myself. I extracted the envelope and examined the paper inside, scanning it in attempt to determine my fault. 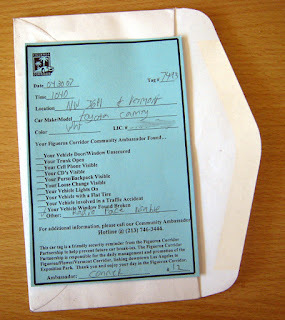 Imagine the pleasant surprise and relief when I found a reminder from my Figueroa Corridor Community Ambassador informing me that my radio faceplate being visable (sic) might lead to a future car break-in. Various sorts of crimes occur with some frequency in the area immediately surrounding USC. I was regularly reminded of this by the weekly (or more) crime report emails sent to USC until I set up a filter to remove them from my inbox. What the Figueroa Corridor Partnership is doing to try to prevent car break-ins seems helpful and interesting, although I wonder about how effective it will be in deterring car crimes. Though this completely anecdotal, I am the worst when it comes to protecting my car from break-ins. I regularly go to my car to realize that I have left it unlocked, I have left my window half-way rolled down, my wallet sitting on the passenger seat, or similar things. As far as I know, my car has never been broken into. I have friends whose cars, on the other hand, have been broken into multiple times. Alex's car was broken into (stereo and other things stolen) when he had parked in my apartment complex's gated, locked garage. His stereo was fancier than mine, but his car also looks like a kicked-in aluminum can. My CD player doesn't work, although you wouldn't be able to tell just looking at it. I'm unlikely to remove my radio face plate as a result of the un-ticket notice, but getting one does make me feel like the area around USC is a little bit friendlier. We went sailing yesterday in good wind (16-17 knots) on a UCLA MAC Vanguard 15 and I experienced my first unintended capsism*. It's not the first time I have capsized a boat; you're forced to do it in Sailing I. But there, it's less clumsy and more planned. We were tacking and I was on the port side of the boat, but I was too slow to get to the other side because my shoe got stuck underneath one of the hiking straps (you purposefully put your feet under them so that you can lean really far out of the boat without falling into the water). And then, in slow motion, the starboard side got higher and higher and I was not on it. Not long after, I was in the water. Not only did the boat capsize, but it turtled as well, i.e., went completely upside-mast-down. It took two attempts for both of us to get the boat upright with us in it. The entire experience was cold, wet, and somewhat windy, and not at all the sort of thing I would want to do on purpose. But it did remind me that Alex is exactly the person I want to have around in a real emergency or other confusing circumstance. Also, we make a good team. I can sink a boat and he can re-sail it. * I don't think "capsism" is actually a word, but thanks to Google I know that somebody once used it here. 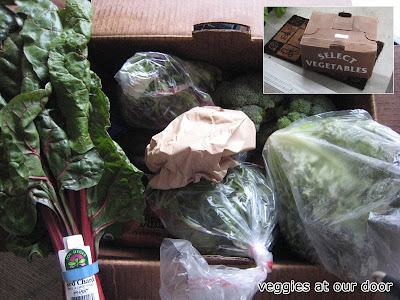 Organic Vegetable Delivery Box by L.O.V.E. We have been getting organic produce delivered from L.O.V.E. Delivery for a little over a month now, leading me to believe that the arrival of Tuesday's box was our 5th. I became interested in organic vegetable delivery last summer when I lived with a roommate in the Bay Area who used a similar service up there. I became re-interested when we were at intergalactically-themed Nova Express Cafe in West Hollywood for a friend's birthday, and I saw a L.O.V.E. flyer. We have discussed the fact that getting the box delivered and eating more organic fruits and vegetables hasn't led to major life change or anything, but we like it. The Vegetables: We get a variety of vegetables that are fresh and in season; what they put in the box makes us more likely to try cooking vegetables we haven't tried before. But it's fully customizable, and you can create a list of "Never Sends" (eggplant is on our list) that they will, not surprisingly, never send. It's fun to decide what to put in the box, and has been a collaborative experience for us the past couple of times. The Box: Has helped us to cut down on the amount of packaging our daily lives seem to generate. Each week we put out an empty reusable box and get one back filled with the goods. The Price: I could get cheaper produce by shopping for it by myself, especially if I buy non-organic. I think after doing some estimates and calculations, I decided that I could buy non-organic equivalents for about $18ish. But I feel like the amount I get is quite reasonable for the quality and price, and I don't mind the delivery. The Price, 2nd: The way things are set up on the web menu, you can replace items in the box with other items from a list of produce items. If you remove something from your box, you can put other things depending on how much room is left in the box. It must be the case that this is tied into the price of the various items, but it isn't transparently. That is, you don't see how much each item costs when you're deciding whether or not to put it in your box. It feels better this way because we can afford to eat good food, it's likely healthier not to make eating decisions based largely on immediate monetary cost, so that's one less thing to worry about. The best way to try to implement a good habit is to make it as easy as possible to do. We are advantaged by the fact that Alex is vegetarian and I love veggies. Maybe it would be easier if the vegetables came washed, and maybe chopped. Cooked, even. Or if they would just eat 5-7 servings of fruits and vegetables-a-day for me. But this is pretty good.